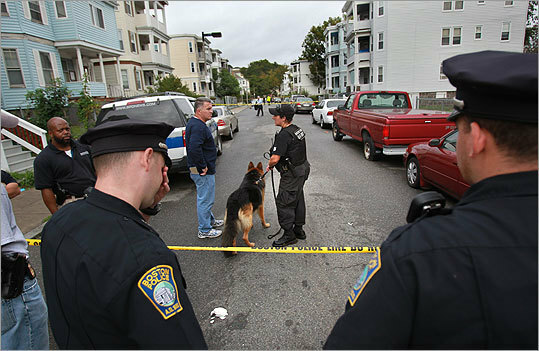 Early this morning, rampant gunfire led Boston Police to respond to 40 Woolson Street in Boston’s Mattapan section, where the bodies of two naked males, Simba Martin and Levaughn Washum-Garrison, and Eyanna Smith and her 2 year old son, Amani Smith, were fatally shot. Another third naked male, Marcus Hurd, who was also shot was rushed to Boston’s Beth Israel Hospital where he was listed in critical condition. The Boston Police have not revealed whether they have any suspects at this time, but have reported that witnesses heard six gunshots, and then see a ‘shadowy’ figure running down the street followed by a silver or light grey vehicle. That the victims’ bodies were found naked in the street, according to the Boston Police, is an indication that the shooting resulted from a robbery or a drug deal gone bad. Boston Police are said to be in the process of obtaining a Search Warrant for a home at 23 Sutton Street in Mattapan, which is believed to be the home of one of the victims, Simba Martin, and where the altercation is believed to have started. Sources also told police that Hurd had gone to Mattapan to buy marijuana. Boston Criminal Lawyer Lefteris K. Travayiakis is available 24/7 for consultation on all misdemeanor and felony charges, including Murder and other Crimes of Violence.